AIRPLANES - Paros has its own airport and is connected by air with Athens by the Greek airlines (Olympic airways, Air greece and Aegean). Olympic airways depart from the west airport of Athens , while Aegean and Air greece depart from the east airport. (of course all you have to do is to tell the taxi driver the company you are flying with and he'll take you to the right place). 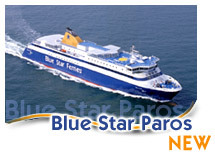 The prices are higher than the those of the ferries and vary between 50-100 Euros. FERRIES - This is the most common way to get to the islands and it remains the usual one for most Greeks and especially for the inhabitants of the islands since you don't need any preparation or bookings. The ferry trip can be a wonderfull experience or very tiresome. It has to do with the weather and the crowd. HIGHSPEEDS - Highspeeds have lately become a very usual way of travelling. They take the half time that the ferry needs to get you anywhere but they will make you the double sicker if are not so used and especially if the weather is not so good.